With an excellent 4.5-star rating on Amazon, you can save 9 tons of water a year (thanks to this RO system’s valve feature and storage tank), and the Aquaphor DWM-101 works perfectly under low pressure without the need for 36w or 60w size booster pumps. Not only is this RO water filter one of the greenest on the market, it also comes with NSF, BPA-free, and LGA certification (for the product and its filters). It reduces water hardness, adds needed minerals to purified water, removes several different kinds of natural tap water toxins, and helps you save money (no to plastic bottles). This and more add to the efficiency of this outstanding RO water filtration system with Russian and German touches. Aquaphor DWM-101 Compact RO Reverse Osmosis Water Filter System is a wonderful product that ensures 99% contamination free water. This professional machine of water treatment helps in using the tap water for drinking and cooking. It helps in attaining the best taste or real flavors of meals, tea, coffee, etc. The balanced mineral concentration included in the purified water makes the taste of water better. It helps you in having a healthier life. As the dimensions of this item are small, it takes only a little space. The dimensions of Aquaphor DWM-101 Compact RO Reverse Osmosis Water Filter System are forty two centimeters length, nineteen centimeters width, and thirty seven centimeters depth. It weighs just 6.2 kilograms. The technical specifications are five liters tank volume, forty to sixty minutes for filling the tank, treatment performance rate of 190 liters per day and treated or drained ratio of 1:5. The replacement filters are available, particularly K2, K5, membrane, and K7M. The period after which filter has to be replaced depends on the type of filter. The RO take care of its main designated function to its optimum level. It lowers the harmful substances as well as hardness in the tap water. 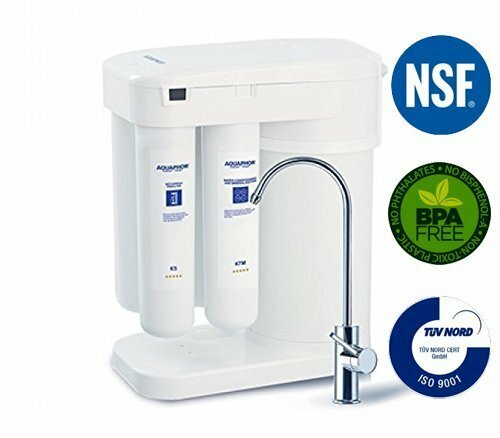 The main factors or substances that are reduced by the Aquaphor DWM-101 Compact RO Reverse Osmosis Water Filter System are fluorides, nitrates, and nitrites, sediments like mud, rust, pollen, and sand. It lowers the amount of bacteria, petrochemicals, viruses, phenols. Metals like copper, iron, aluminum, mercury and lead, chlorine and its compounds, chloroform, pharmaceuticals, antibiotics,hormones, etc., and more are cleared out from the water. This amazing product also conditions the water with added mixture of healthy essential minerals in a balanced manner. Aquaphor DWM-101 Compact RO Reverse Osmosis Water Filter System is created to work at low pressure and real world conditions. It requires two atm (atmosphere unit) for the operation. This product does not need any professional maintenance. As least quantity of waste water is discharged, filtration cartridges will offer better life span. The use of click and turn technology enables the cartridge replacement without the requirement of any particular skills and tools. This product is a great advantage to you as well as the environment. It doesn’t need electricity to operate. When compared to standard common systems of water filtration, DWM-101 uses 2 times less amount of water. Reliable protection is always guaranteed. The RO has a product review Rating of 4.3 out of 5 stars. The model has got 99.5% positive feedback from SOEKS USA when a survey conducted among 1274 users. SOEKS USA is a leading developer, testing and manufacturing company. The Aquaphor Water Filter system has different water treatment stages that give premium quality drinking water. Install it in your home to get good drinking water!